Saint Augustine and his mother, Saint Monica, by Ary Scheffer (1795—1858). From Wikipedia. Almighty God, who didst graciously hear the prayers of blessed Monnica for the conversion of Augustine her son: Grant that we in our intercession may likewise never falter in love nor be wearied in asking; through Jesus Christ our Lord, who liveth and reigneth with thee and the Holy Ghost, ever one God, world without end. Amen. 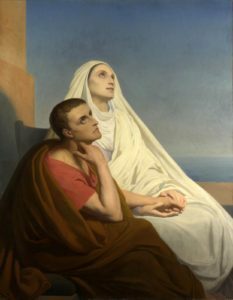 Grant, O Lord, we beseech thee that, as thy faithful servant Monnica, continuing in love and abounding in prayer, was heard of thee, and answered by the conversion of her son Augustine: So we in our intercession may never falter in love or weary in asking; through Jesus Christ our Lord. Amen.